Like a snowball increasing in size as it rolls down a mountain, the 2010 Fans Choice MiLBY Awards have gained an unstoppable momentum. On Monday morning, the polls closed on two hotly contested categories -- Best Team and Best Game. The voting, as always, came down to the wire. Listed forthwith are the franchises and contests that emerged victorious as the popular favorites on the eve of the midterm elections. MLB.com will select the official MiLBY winners before the year is out. BEST TEAM. The following five clubs were deemed the cream of the crop at their level of play. A four-game losing streak to end the season meant that the Clippers had to settle for the International League Wild Card, but despite the backdoor status, the team established itself as frontline postseason competitors. 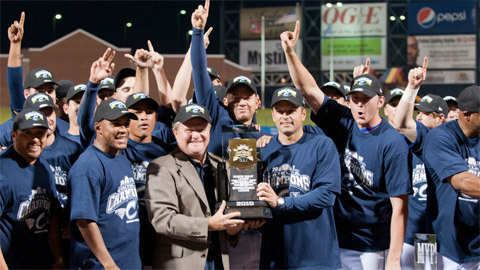 The Clippers dispatched Scranton/Wilkes-Barre and Durham en route to the Governors' Cup and defeated Tacoma in the Triple-A National Baseball Championship. The Rainiers finished second in the voting, falling a single percentage point behind Columbus. Call this a case of virtual revenge. The Thunder compiled the best record in the Eastern League this season but were defeated by the Altoona Curve in the final round of the playoffs. That outcome didn't deter fans from voting for the Thunder, who compiled 34 percent of the vote to the Curve's 32 percent. In the Yankees organization, dynastic aspirations are apparent at all levels of play. The T-Yanks won the Florida State League title for the second time in as many years, and the cherry on top of this Championship sundae was their accumulation of 47 percent of the Fans Choice vote (the largest total in any of the five "Best Team" races). The Loons suffered an upset in the second round of the always unpredictable roller coaster that is the Midwest League playoffs, but during the regular season no team was as dominant. These Class A titans won 90 ballgames -- the most in all of Minor League Baseball -- and followed that up by netting 41 percent of the MiLBY vote. A peek at the Pioneer League standings reveals that Great Falls and Ogden dominated the circuit, but that was in the regular season. In the playoffs, all bets are off. Helena relished its David role, slaying this pair of postseason Goliaths en route to its first league title since the halcyon days of 1996. BEST GAME. It's oft been said that "Good pitching beats good hitting," and this axiom certainly applied to the MiLBY Awards voting. In four of the five categories, a stellar pitching performance emerged as the fans' choice. Veteran knuckleballer R.A. Dickey became the unlikely anchor of the Mets starting rotation this season, and a harbinger of this success occurred in Buffalo on April 29. The 35-year-old was literally perfect after allowing a leadoff single, retiring 27 batters in succession on the strength of his baffling signature pitch. This gem garnered 38 percent of the vote, topping Jason Kipnis' postseason cycle (27 percent) and Mike Moustakas' 11-RBI ballgame (23 percent). Acquired as part of the deal that sent Roy Halladay to Philadelphia, former first-rounder Kyle Drabek enjoyed a breakout season in 2010. The highlight of his stellar campaign was this July 4 no-hitter, the first nine-inning no-no in New Hampshire Fisher Cats history. Drabek earned 35 percent of the vote, topping Altoona's 10-run ninth-inning rally vs. Harrisburg on July 17. Nathan Moreau showed that he was quite able to handle the rigors of Carolina League competition, tossing a no-hitter in his Frederick Keys debut on June 29. The 24-year-old southpaw did not walk a batter in the contest, and the game's only two baserunners reached via errors. Moreau was a doctor of the strike zone that day, with the mound his island. Hickory Crawdads right-hander Jake Brigham allowed singles to the first two batters he faced on Aug. 10, an inauspicious start to what would turn out to be an evening of excellence. The game's third batter lined into a double play, the first of 26 that Brigham would retire en route to a two-hit shutout. Brigham's masterwork garnered 39 percent of the vote, edging out the 35 percent received by J.R Murphy's nine-RBI game for Charleston. Pinch-hitter Daniel Adamson came through in the clutch for Tri-Cities on Sept. 7, blasting a walk-off homer to complete an unlikely 10-9 victory over Batavia in Game 1 of the New York-Penn League semifinals. Adamson's homer set the postseason tone for the ValleyCats, who went on to win their first-ever league title.